About 300 giant pandas live in captivity; no more than 3,000 exist in the wild. The endangered species is not uncommon in pop culture, though, evidenced by animated films such as DreamWorks’ Kung Fu Panda, news stories every time a cub is born in a zoo, and stuffed animals on beds the world over. Vegetarian bears with black-rimmed eyes and fluffy coats, giant pandas are as peculiar as they are rare. A giant panda cub is ready to enter the world after gestating in his mother’s womb for 95 to 160 days. Because a newborn giant panda is born hairless, nearly helpless and the size of a stick of butter, his mother devotes every waking moment to her baby; she doesn’t even leave the den, usually a hollow tree trunk or cave, to eat or drink for days after the birth. However, mother begins to leave the comfort of the den when the cub’s teeth appear around 14 weeks. He begins walking at 21 weeks. He'll nurse until the ripe old age of 18 months. It's time to go off on his own so mama can prepare for her next cub. The giant panda’s natural habitat is the high bamboo forest of western China; 45 percent of the total wild population of giant pandas lives in China’s Minshan Mountains – the highest density of pandas in the wild (see ref 5). This region once provided an abundance of their only food source – bamboo, and the mountains made a protective barrier between the cold northern climate and the wet southern half of China. Unfortunately, the giant panda’s natural habitat has rapidly shrunk since the early 1900s due to human population growth, hunting, logging and land clearing. Giant pandas are solitary mammals, preferring to spend their days moving about in search of bamboo. One of the only times during the year they will encounter and interact with other pandas is during the brief mating season between the months of March and May. With all of their “me” time, they eat. Up to 14 hours a day they spend noshing. The average adult panda consumes 25 to 40 pounds of bamboo each day. Giant pandas live between 14 and 20 years in the wild and up to 35 years in captivity. 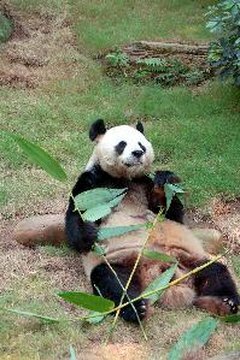 A 2004 study by the Chinese Department of Forestry estimated the population of wild pandas to be around 1,600. Other estimates figure the population between 2,000 and 3,000 giant pandas. Conservation and preservation efforts are in place to protect this extremely endangered species from extinction.